Some culinary combinations are so perfect they can work in a variety of configurations. Bacon, lettuce, and tomato makes a perfect sandwich, but also an amazing pasta (swap out arugula for lettuce). The pairing of chocolate and peanut butter works as well in ice cream as it does in a candy bar. Grilled cheese and tomato soup can be adapted into an eggs Benedict. The combo of graham crackers, marshmallow, and chocolate—recipe first published in a 1927 publication called Tramping And Trailing With The Girl Scouts—is sheer perfection. It’s one of those tastes from your childhood that’s exactly as wonderful as you remember (see also: peanut butter and jelly). So why not try to incorporate s’mores into more traditional, not-campfire related dishes? Sure, you may not want to make crepes on a workday. But for a fun weekend brunch (especially when kids are involved), we recommend giving the taste sensation of s’mores crepes a try. Mix milk, flour, eggs, sugar, salt, and oil thoroughly into a batter. Let chill in fridge for an hour. Then fry up crepes in butter, using a ladle to pour the batter onto a frying pan. Flip once. Lay a cooked crepe out on a large plate. Microwave the fluff jar briefly (making sure it’s a jar with no metal), only about 10 seconds or so. Spread a tablespoon of fluff on one side of the crepe. 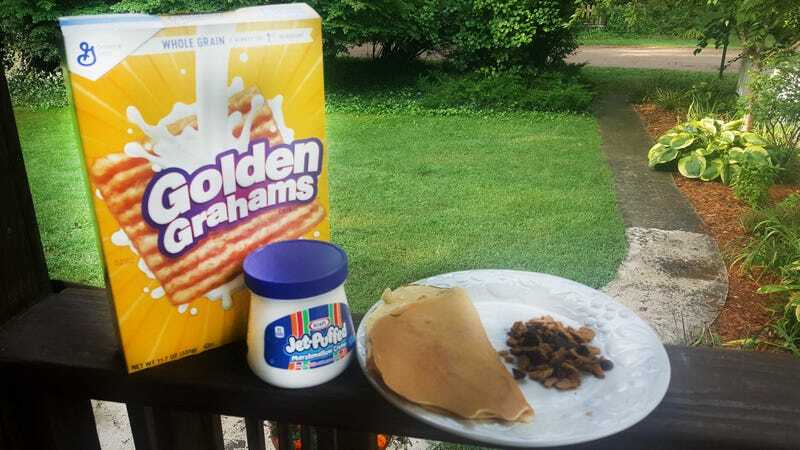 Sprinkle a tablespoon of slightly crushed Golden Grahams, and a tablespoon of mini-chocolate chips on top of the fluff. Fold crepe over and serve (with fruit, I beg of you).